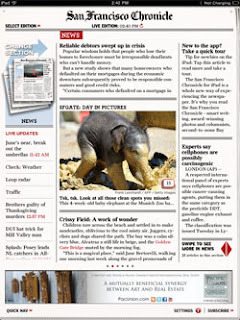 While some magazine and newspaper publishers are seeing spotty results with digital editions of their content specifically tailored for the iPad, the millions of Apple tablet owners remain an attractive target for print media brands looking to make additional cash, stemming the bleeding from years of declining subscribers and advertising dollars. 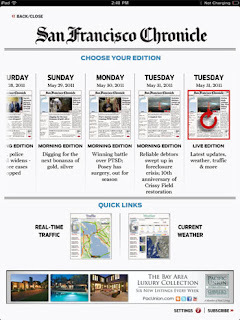 The latest entrant is the Bay Area's own San Francisco Chronicle, who introduced its iPad app today, free to subscribers, but premium for all others, bringing the full content of the day's paper (and editions from the week prior) into your hands without the complementary ink and subsequent visit to the recycle bin. 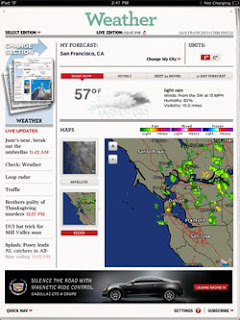 The Chronicle's iPad app delivers edition integrity for the day's paper, containing all stories from all editions, but also features a "Live Edition", marrying the existing content with real-time traffic, weather and news updates. This essentially provides the best of both worlds, letting you meander the paper as you would traditionally, while also getting the benefit of being Web connected. 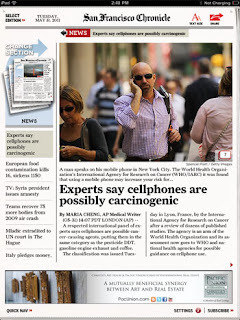 The application looks and behaves like a standard newspaper, with lead stories, backstories on subsequent pages (a swipe away, of course), and more details from each story continuing on the jump (newspaper parlance for continuing on a later page). But visual perks to the app leverage the fact it's a digital edition, including a sectional carousel that you can navigate left to right (or the reverse) to browse from Business to Sports, Obits and the front page, for example. 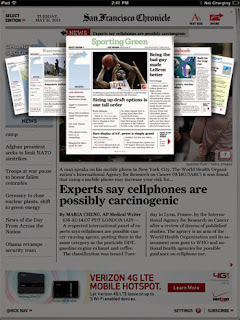 For existing paper subscribers, the new app is free. 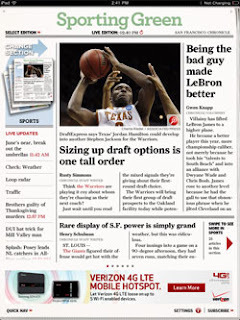 For those who don't get the paper, after a free 30 day period, access is priced at $5.99 a month or $59.99 a year. This compares to $99 a year for full access to the paper's online edition, or $9.75 a week to get the paper home delivered, Monday through Sunday. With the exception of the controversial The Daily and national news media apps, like those from the New York Times and Wall Street Journal, the most lauded media apps have been almost entirely social, with Flipboard being the most widely known, followed by Zite and others. 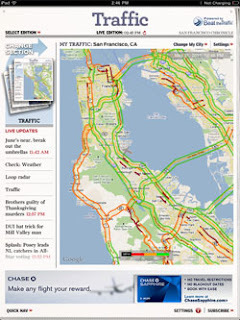 The San Francisco Chronicle's app is not designed to bring in social content, but sharing outward to Twitter and Facebook is integrated easily. 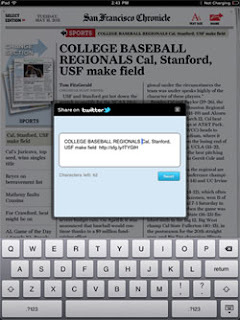 Once your credentials are included, you can share out using the Chronicle's custom URL shortener. Meanwhile, if you are going to be offline, you can download up to ten stories for local reading. The app itself is free for download, outside of the aforementioned charges. Each page of the app contains a standard horizontal Web banner ad, which no doubt brings in a few dollars to the paper as well. If you're in the race to kill of physical media like I am, moving the Chronicle to your tablet certainly helps in this quest. There's not yet an Android option and the company hasn't announced plans to develop one yet.